My friend Cindy is having a girl! So when I went to make her a baby quilt I really girl’d it up! Must be a reaction against all the blue in my house. In a fit of creative energy I just jumped into making this quilt. Amazing that it turned out. I started by sketching out the quilt which was good but then I just started cutting willy nilly with no measuring. This made for tricky assembly when piecing the quilt together. Had to fudge more than a few intersections together. It was tricky with the pieces being irregular.. I thought I’d figured out the seam allowances but math got the better of me once again. I was so pleased when I started yanking pinks off the shelves that I had so many to choose from. I decided on a pinky/orange theme and then found the plaid down in the basement and it really pulled the quilt together. After piecing the quilt top I outlined with tiny tiny white rick rack. That was another tricky bit as the sewing machine presser foot kept pushing the rick rack out of place. When I was done I hand quilted around the floral/butterfly pattern on the backing and then around the trim. Even on such a small quilt this was a lot of work but handquilting looks so cool. I hope little Margot likes it! i absolutely love this quilt. it is just beautiful. i have a big appreciation for anything hand done. 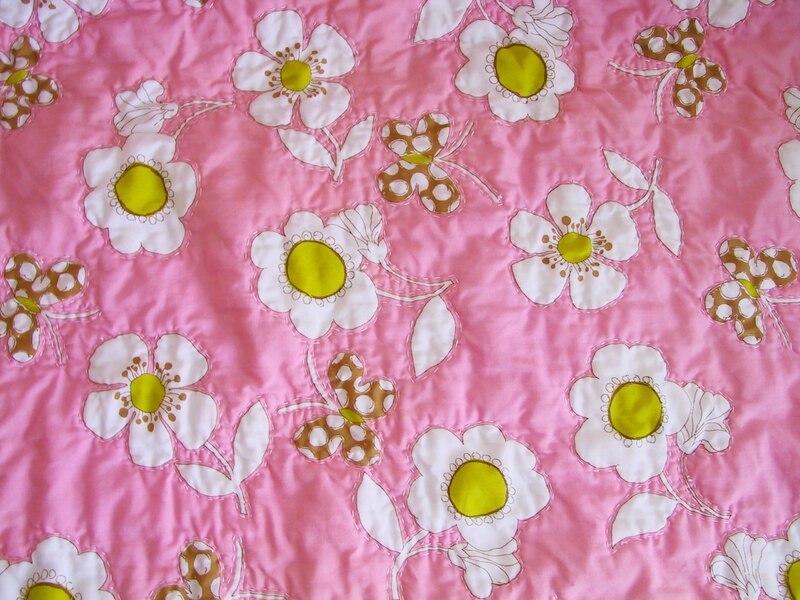 the quilting you did by hand around the flowers on the backing is just perfect. i have one question. i’m quite new to quilting…when you did the back quilting by hand …you went through all 2 or 3 layers right? so that would mean your outline of the flowers would show on the front? hope that’s not confusing. again, you did a wonderful job. Thanks so much! I’m really happy I decided to hand quilt it. I’m working on a few other projects that I’m quilting on the sewing machine and they just don’t have the same charm. I did go through all 3 layers when I quilted by hand. I basted together the front and back with the batting inside and then quilted a section at a time in my small circle frame. It is hard to see the outlines on the patchwork side. I’m going to add another picture so you can maybe see it better. I got so inspired that I decided to make a quilt out of my little guys baby clothes. Thanks to your great idea! He still has some growing to do, so it’ll be an on going process. He’s 6.5 months old : ). I’ve never made one before, was wondering if you can post some tips for me. What do you use for the inside layer of the quilt? I already cut some quilt squares last night out of his old velour sleeper. I’ll send you a pic, when I finish it, maybe months from now, since, I work full time and I don’t have alot of time to craft. I’d appreciate any advice, thanks so much! hi! i am very glad to find this site. these quilt are very nice and cute. i myself want to make some quilt for my elder sister’s baby thats why i am searching website and found nothing, but your site has given me inspiration to make something good, thanks again Hillay. plz give more to this site. I am looking to make a quilt for a baby shower. The idea is to have the guests each sign a message to the baby on a piece of the quilt. This is a really wonderful idea. Where do you get all the materials?